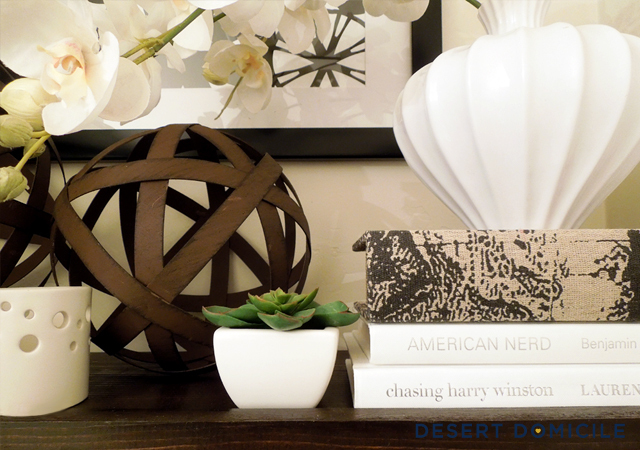 Thanks to Allison at House of Hepworths and Shannon at AKA Design for featuring my shelves! A huge thank you also goes out to Kate at Centsational Girl for featuring my shelves in her 'Best of the Blogosphere' round up! This is what I envisioned the shelves looking like if you were a giant that was looking straight down on them. I wanted to build a hidden inner frame that the top and bottom boards could sit on/screw into. To make everything look as seamless as possible, I wanted the width of the top board (AKA top of the shelf), hidden side support brace boards, and bottom board (AKA the bottom of the shelf) to equal the height of the front piece (AKA the front of the shelf) so that when everything was put together, each shelf would look like one chunky piece of solid wood. Once we had an idea of how the shelves were going to be built, we headed to Lowe's to get our supplies. We spent over an hour in the store deciding on what kind of wood to buy, what cuts needed to be made in the store (so we could get the wood in my car), and how thick to make the shelves. We had our board cut into 2, 31 3/4" pieces (the width of our wall) and then we had each of those pieces ripped down to 4" (the height/thickness of our shelves). 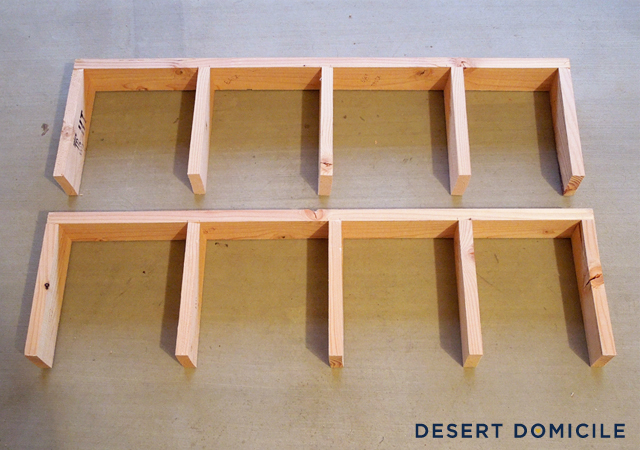 We had our board cut into 4, 31 3/4" pieces (2 for each shelf). 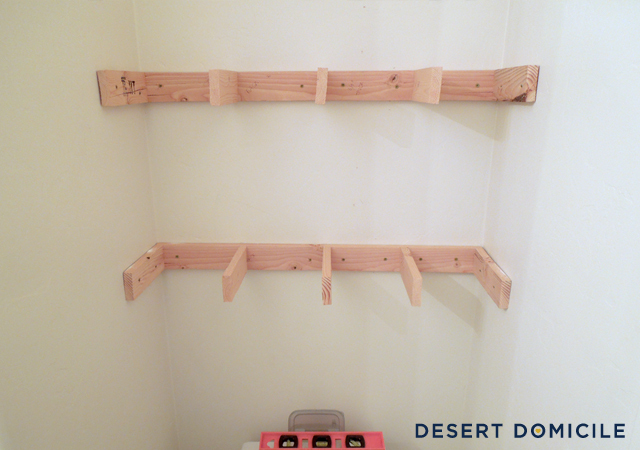 We cut the following pieces at home: 2, 31 3/4" back support pieces, 4, 8" side support pieces (2 for each shelf), and 6, 8" middle support pieces (3 for each shelf). TIP: Don't forget to buy screws/nails and stain/poly if you don't have any at home! 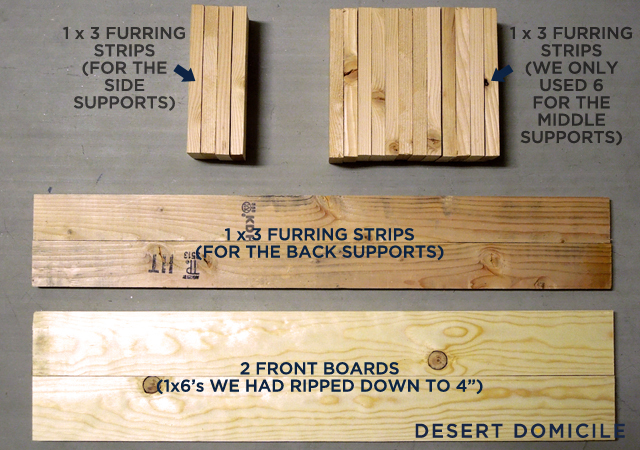 After we cut the furring strips into 8" pieces, we started to build the two hidden inner frames. Each frame required one 31 3/4" back piece, 2, 8" side support pieces and 3, 8" middle support pieces. To assemble the hidden inner frames, we used wood screws to screw each of the 8" furring strip support pieces into the back support piece from the back. We made sure that the side pieces were lined up with the edge of the back piece but we didn't worry about the spacing of the middle support pieces since no one would see them and we weren't planning on putting heavy objects on the shelves anyway. After both of the hidden inner frames were built, it was time to attach them to the wall. To figure out the placement of the bottom shelf, I measured 4 feet up from the tile floor (no reason, just liked the height) and made a mark. 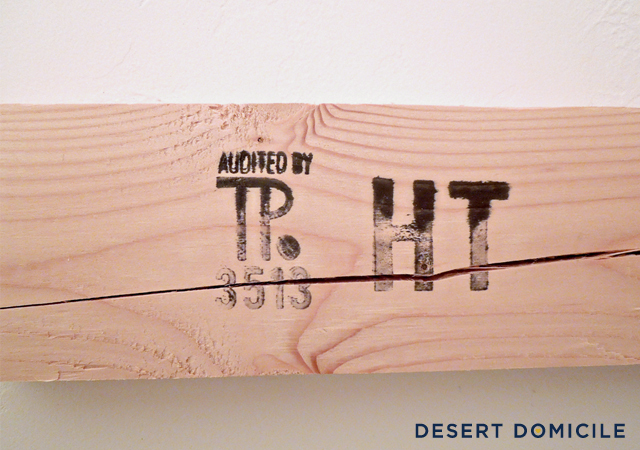 Then I measured 4" (the overall height of our shelves) up from that line and made another mark. 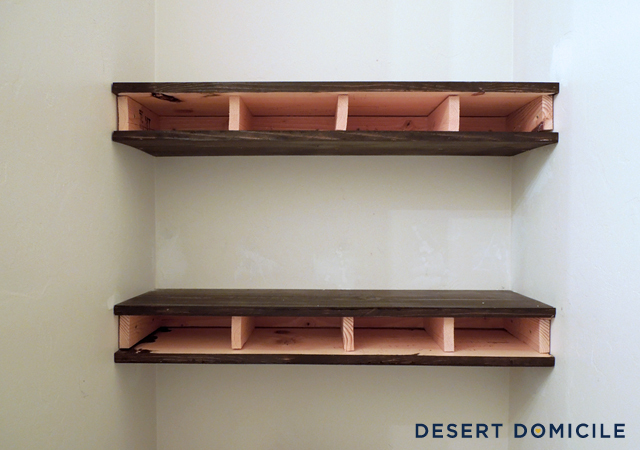 I stood back to view the placement and liked what I saw so we measured 3/4" (the thickness of our top shelf) down from the top line and another 3/4" (the thickness of our bottom shelf) up from the bottom line to mark our placement for the hidden inner frame. TIP: Make sure you leave plenty of clearance around your plumbing pipes so you don't screw into them! After we had the first hidden inner frame hung, we measured 12" from the top line we marked earlier and made another mark for the bottom of the upper shelf. Then we measured 4" up from that mark for the top of the upper shelf. 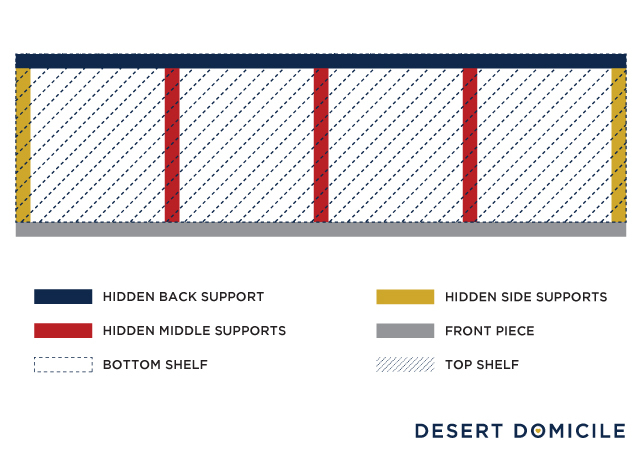 From there we measured 3/4" (the thickness of our top shelf) down from the top line and another 3/4" (the thickness of our bottom shelf) up from the bottom line to mark our placement for the second hidden inner frame. An hour later the lacquer had dried which meant that it was time to attach the top and bottom shelves to the hidden inner frame. 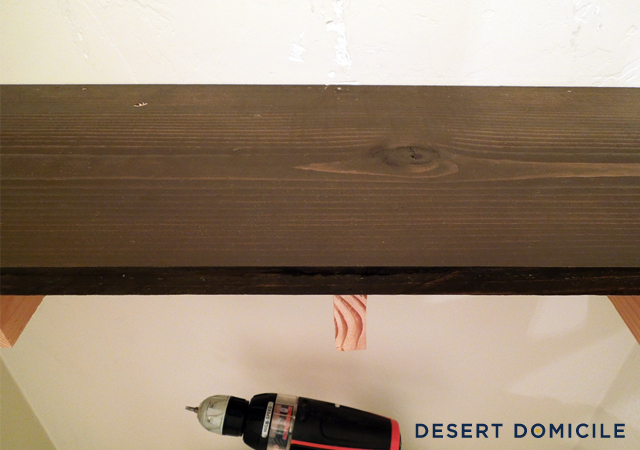 I attached the top of the lower shelf first by flipping the board over to the non-stained side and running a small band of wood glue around all of the edges EXCEPT for the front edge. Then I flipped the board over, set it in place and pressed down making sure the top made contact with the back and side supports. 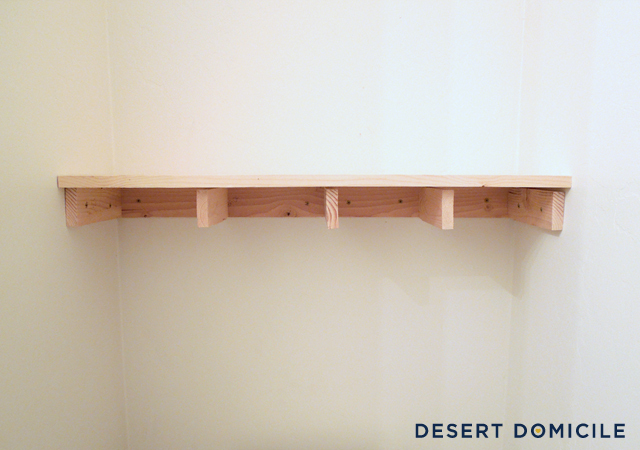 To attach the bottom shelf, I used the same wood screws I used to screw the hidden inner frame into the wall. I held the board up underneath the frame (stain side out) and screwed one screw into the center middle support. Then I screwed 1 screw into the remaining 2 middle supports and 1 screw into each side support for a total of 5 screws. I made sure to set the screws back about halfway from the front so they wouldn't be visible when looking at the shelves. Funny story: see that mark on the top left side support? 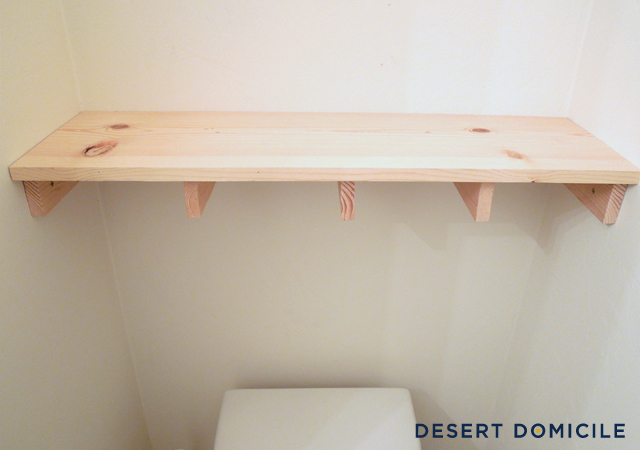 When the second shelf was finished, it was time to attach the front facing piece to each shelf. 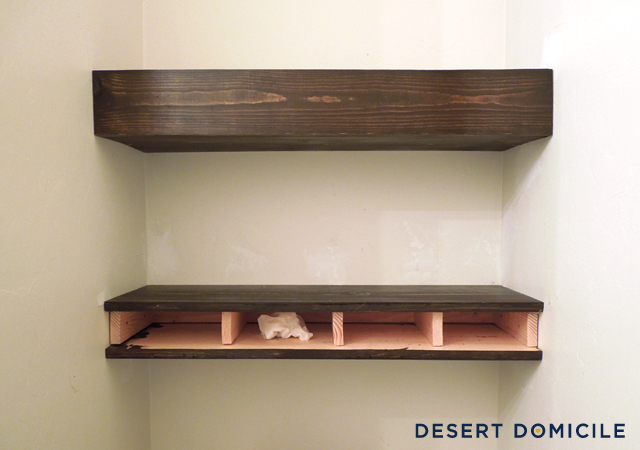 In order for the shelves to look as professional and seamless as possible, I knew I couldn't use nails or screws so I used wood glue for the top shelf's front piece and Liquid Nails for the bottom shelf's front piece. More on that in a minute. Then I lined the bottom edge of the front piece up with the bottom edge of the shelf. I wanted these edges to match perfectly since it's what people would see at eye-level. Once they were even, I pressed the front piece against the rest of the shelf and held it for what felt like forever (Note to self: buy clamps!). Some wood glue did seep out the bottom so I had my boyfriend grab me some damp paper towels that I could use to wipe the glue up with. After about 20 minutes, the top shelf's front piece was pretty much stuck in place so I let go of it and moved on to attaching the lower shelf's front piece. Like I said above, I used Liquid Nails to attach this piece. Why? Well I tried using the same wood glue I used on the top shelf's front piece but no matter how hard I pressed on the board or how long I held it in place, it kept slipping and eventually fell off. When it fell, I realized that the board was bowed so much that the bottom edge wasn't even touching the bottom shelf's edge so I broke out the Liquid Nails, ran a bead of it along each edge, held my breath, and pressed it in place. I made sure that the top edge of the front piece matched the top of the shelf perfectly and then pressed the board into place for another 20 minutes. When I let go this time, the front piece was stuck in place! How about a little before and after action? TOTAL: $28.96 or $14.48 each shelf! Not too bad, huh? Note: this project may cost you more than $28.96 depending on the supplies you need to purchase and where you purchase them from. I'm sharing this project on: AKA Design, Alderberry Hill, DIY By Design, DIY Showoff, Fireflies and Jellybeans, House of Hepworths, House on the Way, Not JUST A Housewife, Shabby Nest, and The Shabby Creek Cottage. They look seriously awesome. Perfect for a bathroom over the toilet. Just wanted to let you know I've been reading for a while but this is my first comment. I love your style. Also, I want to come raid your trinket stash! Love.it. They're gorgeous Caitlin! Love your styling too! Brandi is definitely right about want to raid your stash! This looks awesome! 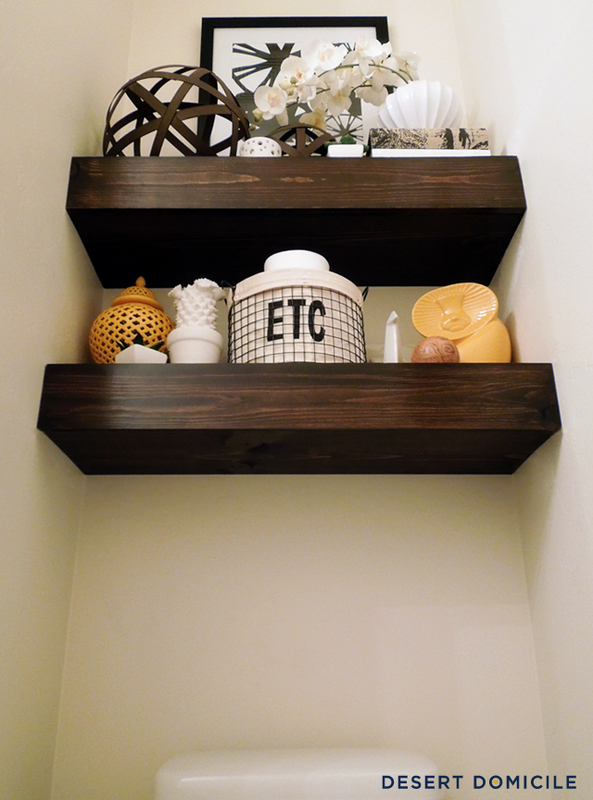 I love floating shelves and I LOVE that you went with such thick ones!! Hi Caitlin - Quick question - I looked and haven't found a reliable source on how to get the social media buttons like you have at the top. Is it really easy and I'm just being stupid? How did you do it? I designed the icons myself and then uploaded them to Photobucket. Once they were uploaded, I copied the code and added them to an HTML widget in my sidebar. Then I changed the links to my social media sites and voila! Let me know if you need help and if so, I can send you the exact code! Thanks Caitlin! So mine don't look as cool as yours but I did it (I'll have to figure out how to my own design later)! Thanks again! Lovin your shelves! Great job and awesome tutorial! Stop by House on the Way tomorrow to see them featured! If you'd like, grab a "house featured" button! I ADORE YOUR SHELVES!!! 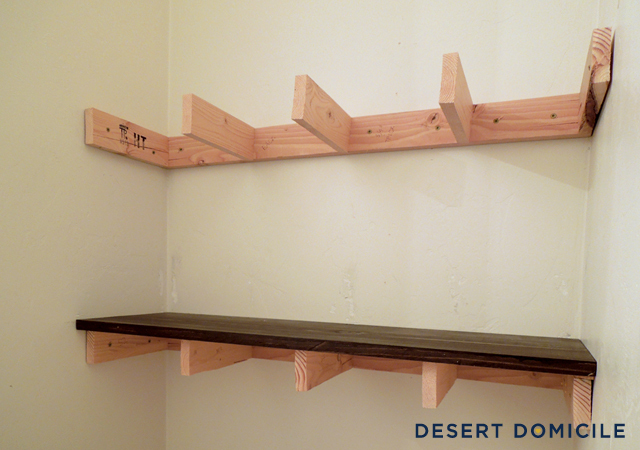 What an innovative way to create super large shelves! Thanks for linking up to our party, btw! LOVE these! And for $14.48 per shelf?! Seriously, can you fly to Indiana and help me with some projects? I love how you styled them. Amazing job! 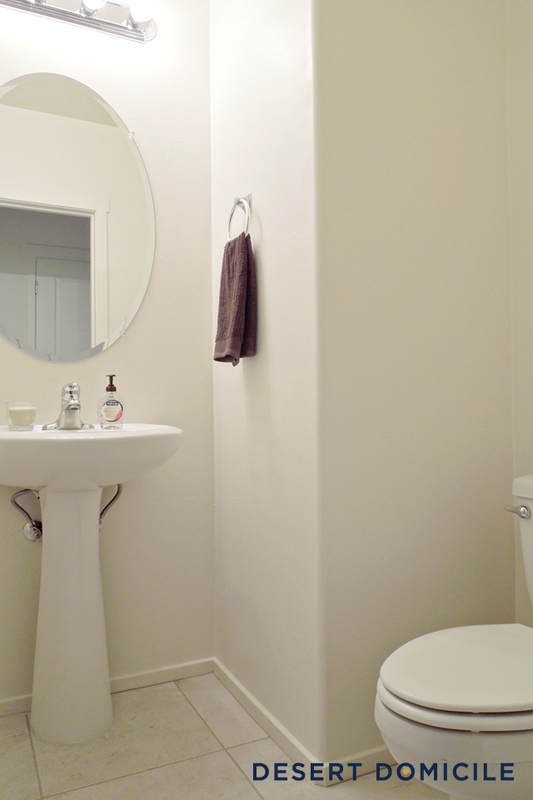 We've wanted to do this exact same thing in our master bath/toilet area for over a year now. I'm totally showing this to my husband in hopes that we get it accomplished this weekend! Great tutorial! I love this. I'm definitely adding this to our remodel list of must haves! Thanks for all the steps!! They look awesome!! Gonna have to give this a try for my downstairs half bath! They look gorgeous! 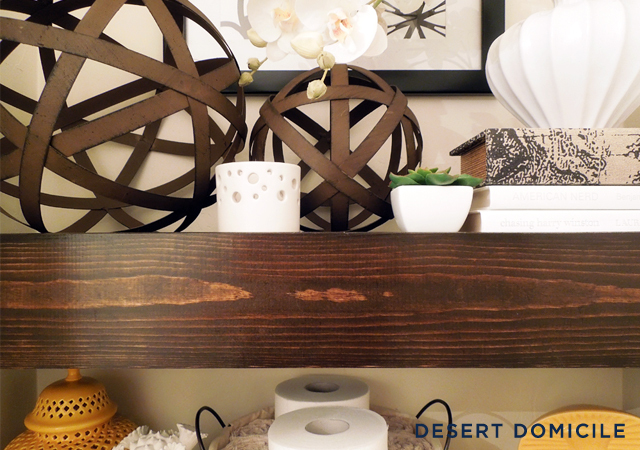 The styling you did on the shelves is perfect and simple. Love the look of this! I will definately try this. My husband will be happy because he will not build anything that is not super sturdy and these seem to pass his test! Thanks for sharing! Paulette - My boyfriend was practically hanging from the shelves and they didn't budge so they should pass your husband's test! These turned out beautiful. This will most certainly go on my "To Do" list! Thanks for sharing this with such a great tutorial! Awesome job, Caitlin! They're gorgeous! Great tutorial too. Love the chunkiness, love the dark rich color! Great DIY. Easy to do and looks fabulous! Great for any location in the house. I'll have to forward this to a client whose husband is handy! I love this project especially the pretty styling - would you be able to provide details of the ornaments and things you used? Thanks. Mags - Absolutely! I'm going to put together a source post for everything that will go live tomorrow so be sure to check back! I am hopping over from Censational Girls BOTB and I want to say BRAVO!! 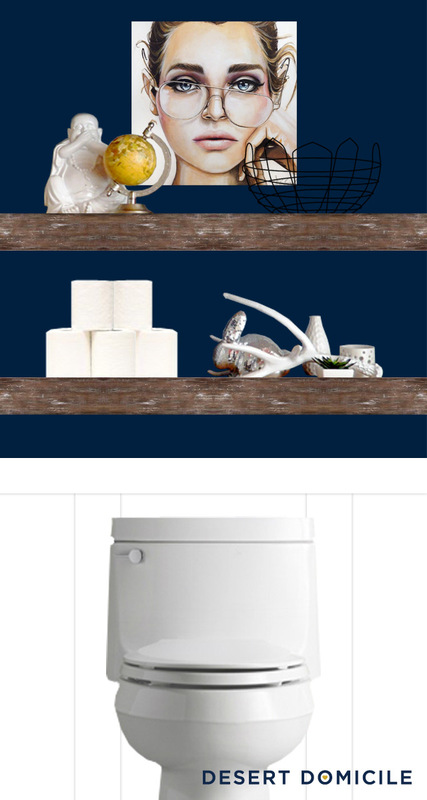 I have been planning to do the same short of shelves for my bathroom, but I was just going to buy! Now I will be making then for sure! Awesome job and the styling looks amazing! 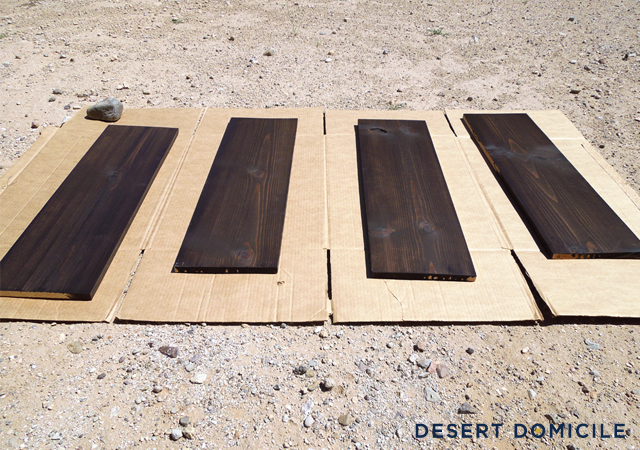 Did you use any poly on the stained pieces, or just the raw stain? Thanks Tiffany! Let me know how yours turn out! Killswitch22 - I used spray lacquer to seal the stain/wood instead of poly. 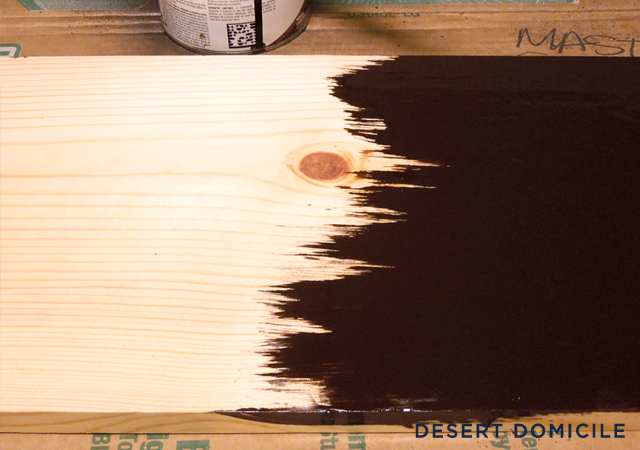 If you feel comfortable using poly, you can skip the spray lacquering step above and use poly instead! What an amazing project. 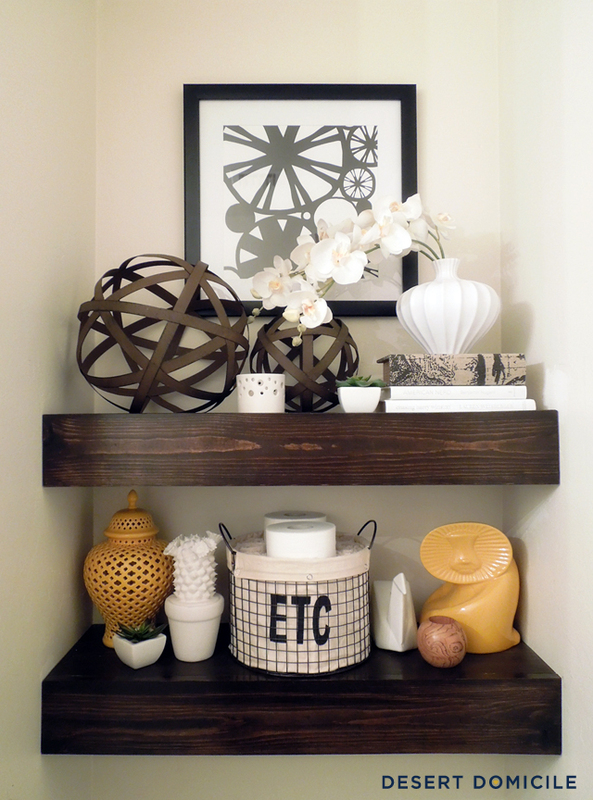 I would like to add a floating shelf in my kids playroom and I am going to pin this tutorial. I would love for you to come and link up to my Fall into Fall party that opens Tuesday evenings at 8pm EST. Hope to see you there. Dev-Lyn: Thanks! The walls are painted 'Birch White' by Dunn Edwards. 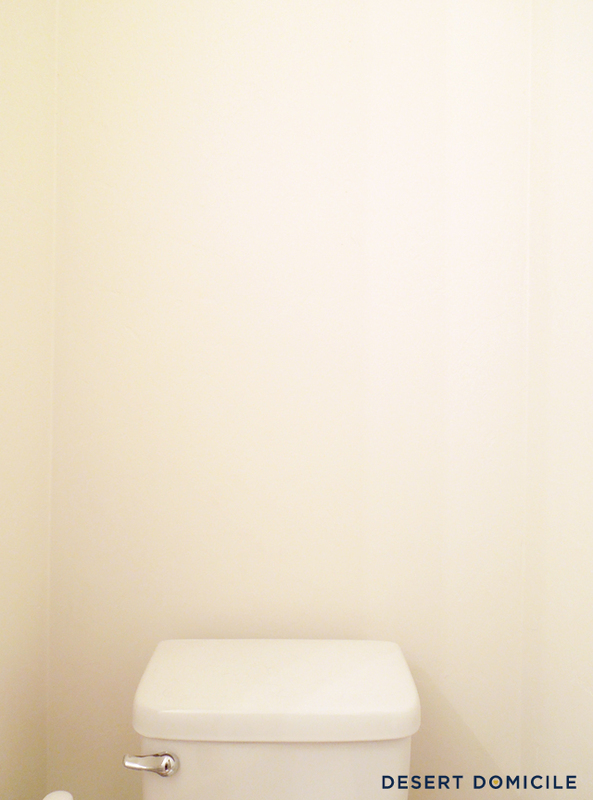 It's the color I chose for my entire house but I just finished painting the powder room Valspar's 'Hazy Stratus' last night! Love the 2 distressed, metal looking balls. Where did you get them!? I found you via Centsational Girl. What an awesome tutorial! You made it really simple... So simple, in fact, that I'm searching through my house for a nook to install these! Great job, and congrats on the features! This is incredible. I absolutely love this project! Your site is amazing! I can't wait to keep following! If you like craft DIY ideas please check out my blog! LOVE this. i'm totally going to try this. I also want to make a chunky wooden ledge for our fireplace mantle, so your instructions were very helpful. I've been wanting to build something like this for our mbth for ages. Thank you so much for the thoughtful instructions I can't wait to tackle this project! : ) It looks awesome! This is brilliant and I'm totally doing this! 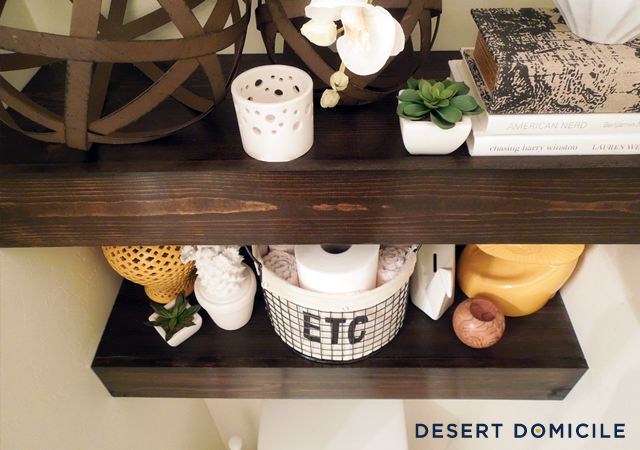 We have been debating the best way to build floating shelves forever - This looks really simple and I'm in love with this. Jennifer - Thanks! 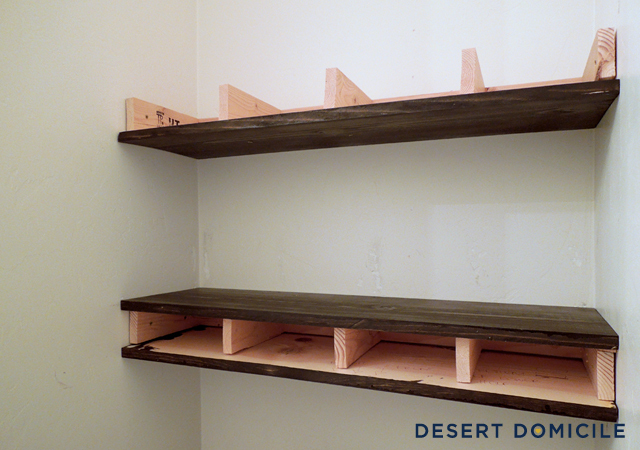 When your shelves are complete, shoot me a link - I'd love to see them! Seriously. Where did you find that adorable bull?!? I LOVE him!! Great work on the shelves, too. I'll be stalking Home Goods from this point forward! Thanks! I love this post and one day i swear I will make a batch of these! You did an awesome job!! 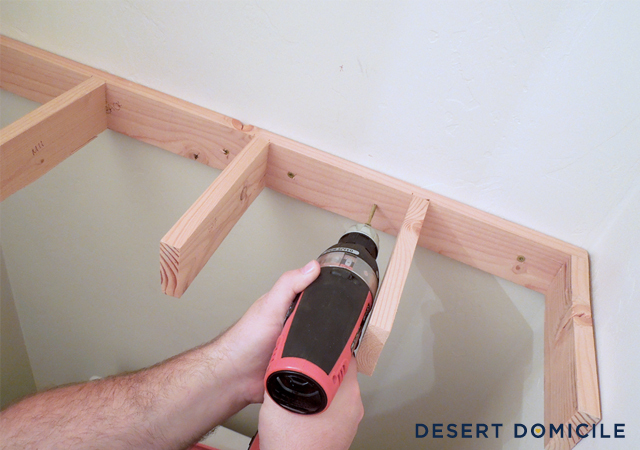 but even if you did have clamps... how would it help to hold that front part in place while the adhesive dried? MamideRay - That's a good question haha I didn't really think about that! If you don't want to hold it in place, you could always use a nail gun or a hammer and nails to drive some nails into the front of it. 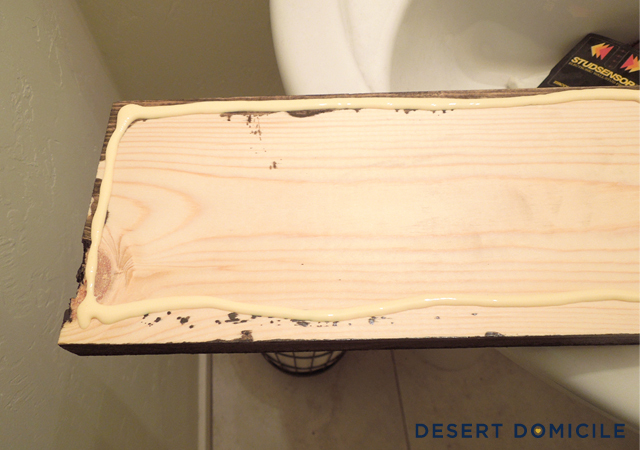 Just fill the holes with wood filler, touch up the stain and poly and you should be good to go! I just came across these shelves on pinterest. Love them so much I blogged about them this morning, hopefully I get around to attempting them myself at some point! 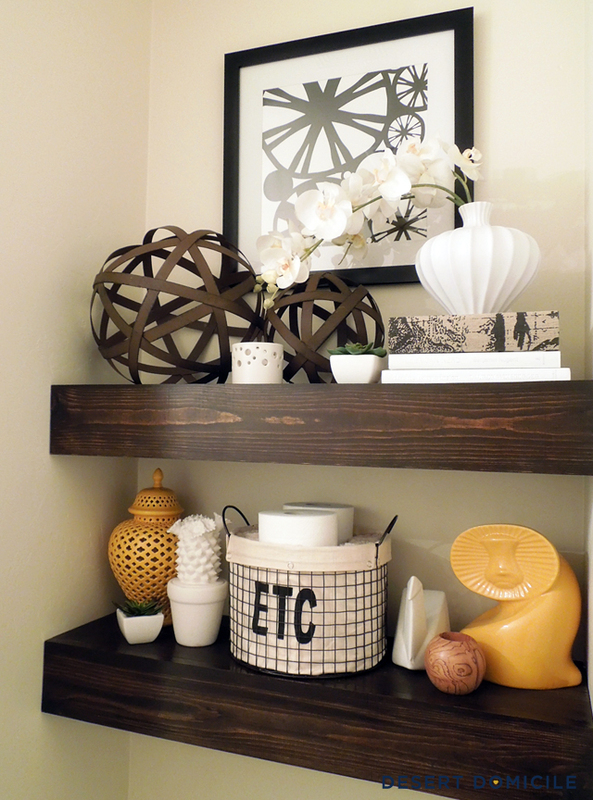 I love these shelves! That is such a great way to do an easy display. 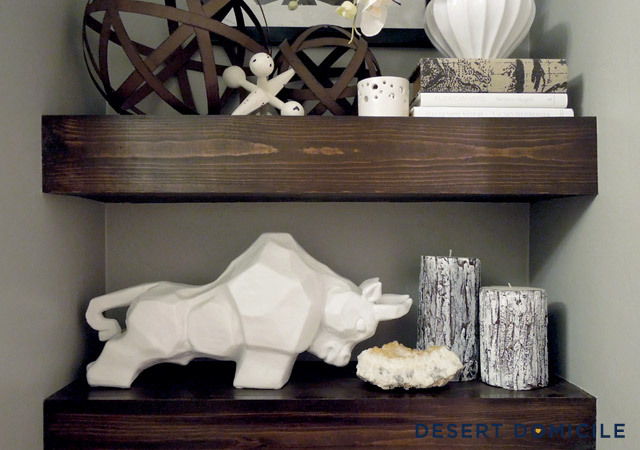 If you are looking for a statement piece for this room or your kitchen, Sarabella Tuscan Jars has great pieces of art! Wow, these are amazing! I love them. And your tutorial must be awesome too, because I checked out Stacey's (above commenter) and hers were gorgeous as well! 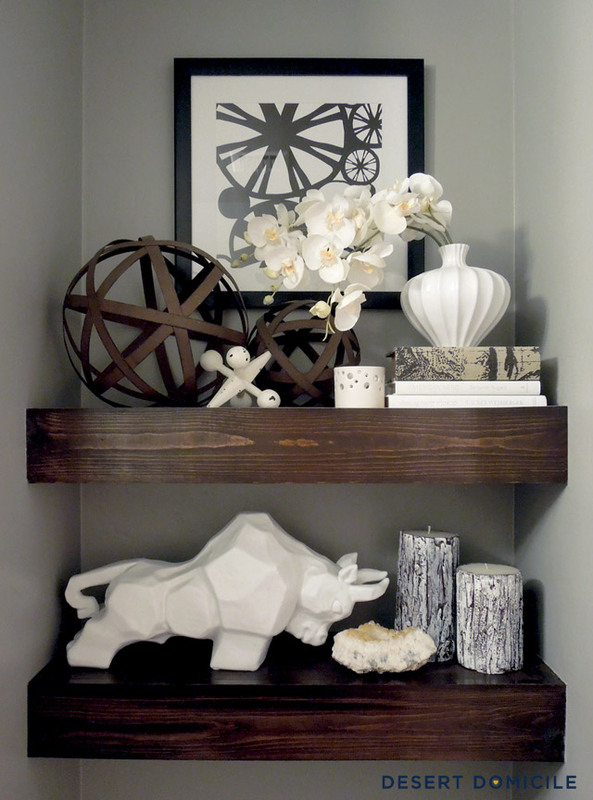 I love these shelves! I have a space at the end of my hallway that these are perfect for..and my father inlaw is a contractor so I can the wood for free woot woot!! Lol.. This has been a while since posted. 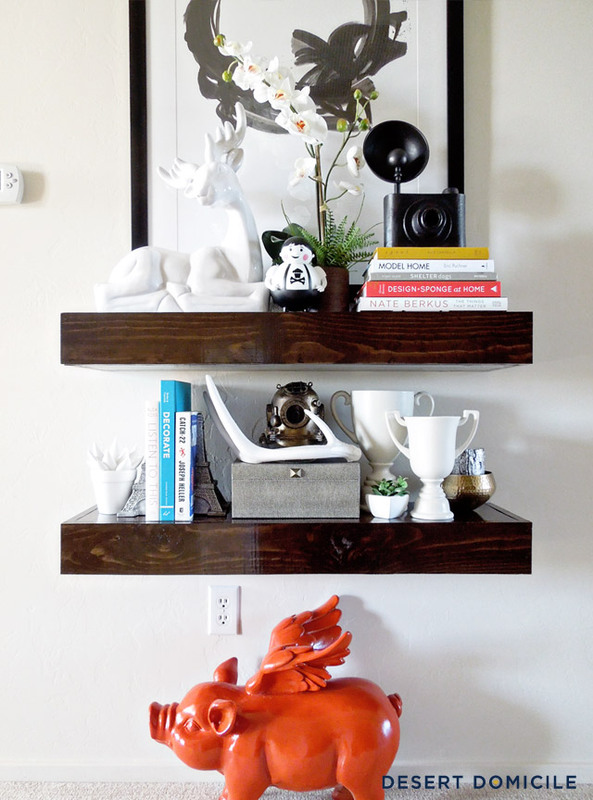 I love your shelves but am struggling to find any just like yours that are floating. These have to be in a cornered wall. 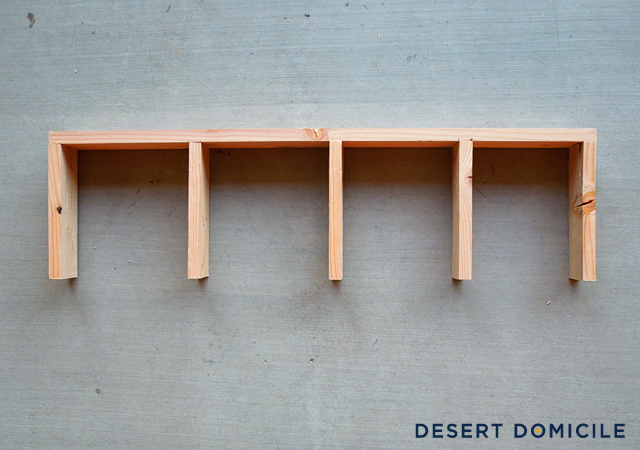 I need a shelf like this that can float on its own without being drilled on the side. Any suggestions? P.s. I'm in love with these. You are a brilliant. This is exactly what I was looking for. Thank you! These are great! 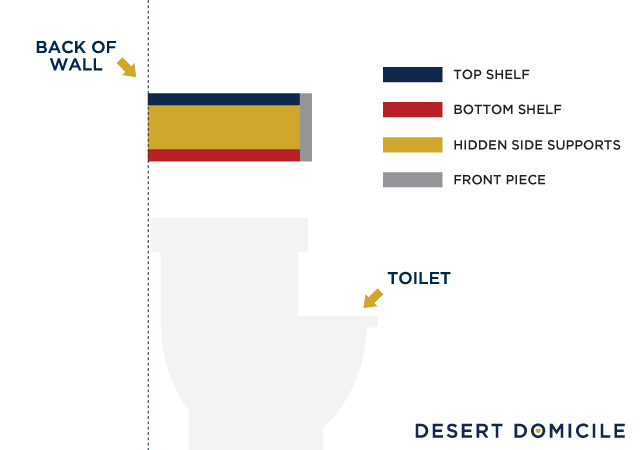 I was wanting to put shelves in the bathroom over our toilet (same configuration where it's set back into a "niche"), but wasn't loving some of the options I'd seen. I think we're going to tackle this this weekend! I think these look beautiful and I love the way you have styled them! My hubby and I started on these today hopefully ours will look as good as yours. Thankyou for the step by step illustrations. 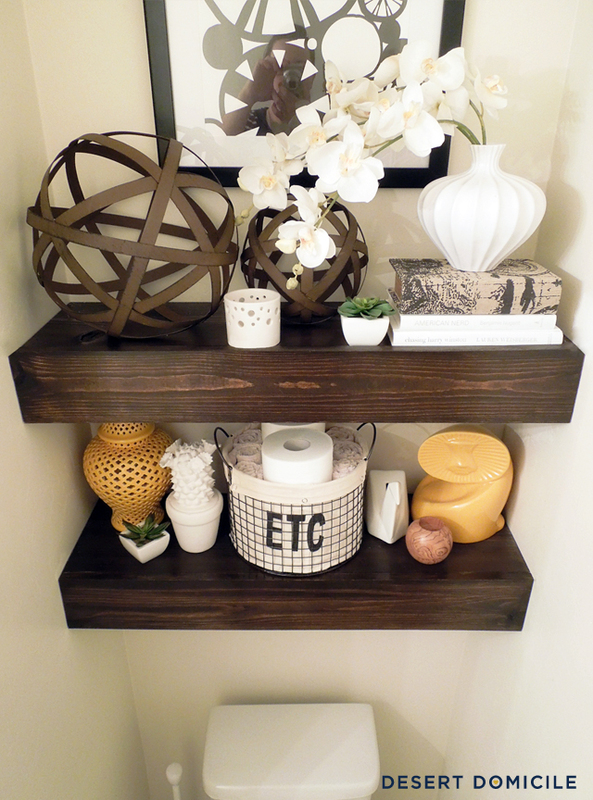 Just discovered your blog and this tutorial on making chunky wood shelves. Love them...and your home! What stain color did you use & what are the final dimensions (height & depth)? I don't have any tips, unfortunately. We built our home so I looked at photos of the plumbing when the walls were open and made sure to avoid the areas around any pipes. If you have a plumber friend, I would ask them! Or maybe someone at Home Depot/Lowe's would know! Can you tell me where you got the bull, I like it and want it in my bathroom. I got it from HomeGoods several years ago. Their inventory is always changing so I'm not sure if you'll be able to find one there. Try searching eBay or Etsy for one! This is fantastic. The spacing is just right! Is it bad that I want these all over our home? Thanks for the tutorial!